The Philadelphia Public Relations Association has lost a long-time and beloved member of its family. We are saddened to announce that Sally Berlin has passed away this past weekend on Saturday, October, 25th. Sally, a well-known PR pro in the Philadelphia area, served as PPRA’s President in 1976-77. She was one of the first women to become inducted into the PPRA Hall of Fame in 1986. 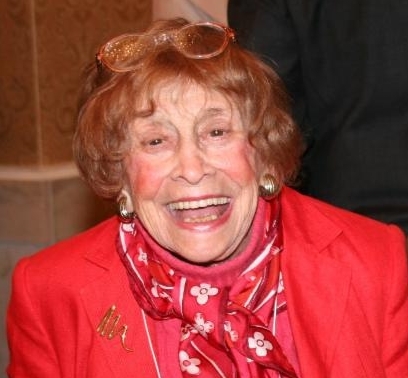 Sally stood only 4 feet, 10 inches tall but was known as a PR giant and ageless dynamo by those who knew her. She cherished the Philadelphia Public Relations Association, making it a high priority to attend PPRA programs. She eagerly volunteered her time and demonstrated her passion for the public relations industry by sharing her influential and creative ideas to help boost a city in which she loved, the city of Philadelphia. Aside from her affiliation with PPRA, Sally worked hard to expand the Police Athletic League of Philadelphia, (PAL). Working as an adviser for PAL well into her 90s, Sally raised millions of dollars for the non-profit corporation throughout her career. “In all the years I had the privilege of knowing Sally, I never heard her say an unkind word about anyone. In fact, she saw the best in everyone and became their champion, spreading the word about their talents and achievements,” said Gloria Hochman. We have truly lost an extraordinary individual and vibrant personality. Sally will be missed by all that were lucky enough to cross path’s with such a genuine person. This entry was posted in Member Spotlight, Message for Members and tagged Honor, Member, Member Spotlight, PAL, Philly Philadelphia, PPRA, PR, PRowl Public Relations, Public Relations, Temple University, Tribute by pprablog. Bookmark the permalink.